The Meadow Garden is fascinating even in the winter months. A recently posted book review on Sowing Beauty discussed some of the technical aspects of designing meadow gardens and mentioned two local meadows to view. 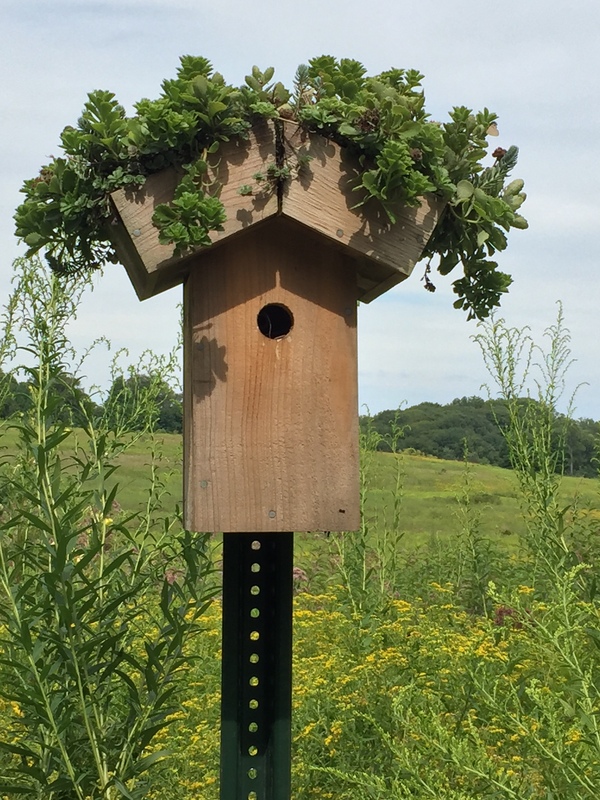 Gardeners may also wish to visit a much larger meadow with educational signage at Longwood Gardens in Kennett Square, PA.
Birdhouse to support the meadow bird population. The Meadow Garden, designed by Jonathan Alderson of Wayne, PA, and installed in 2014 by field crews from Applied Ecological Services, is an example of ecological landscape design, a blend of horticulture and ecology in the service of sustainability. In this approach, human interventions, such as seeding and plug planting of native plant species and control of invasives, are undertaken to promote native flora and fauna. A measure of the success of this methodology is the health of the local bird populations, which have seeds, fruits, and a large biomass of insects available for feeding. Recent bird inventories include tree swallows, chickadees, and wrens; 170 bluebirds fledge in the meadow every year. 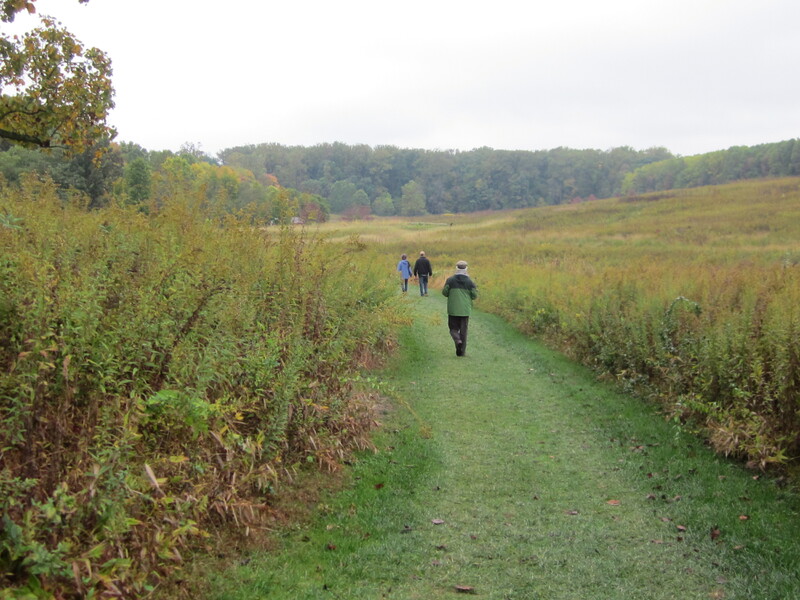 The Meadow, which now comprises 86 acres bordered by a grove of Quercus alba (white oak) and Fagus grandifolia (American beech), highlights native wildflowers and warm-season grasses of the region. Native flora that were already present at the site include Asclepias (milkweed), Symphyotrichum (aster), Carex (sedge), and Solidago (goldenrod) species, as well as Eupatorium purpureum (Joe Pye weed), Pycnanthemum virginianum (mountain mint), and Vernonia noveboracensis (New York ironweed)*. Introduced species which have naturalized well include Liatris spicata (blazing star), Helianthus giganteus (tall sunflower), and Monarda fistulosa (wild bergamot). 110,000 plugs of these and other plants have been added to increase the diversity of habitat. Added together, all the plants provide sweeps of color through the seasons. Mown paths lead visitors on hikes of various lengths through the meadow. 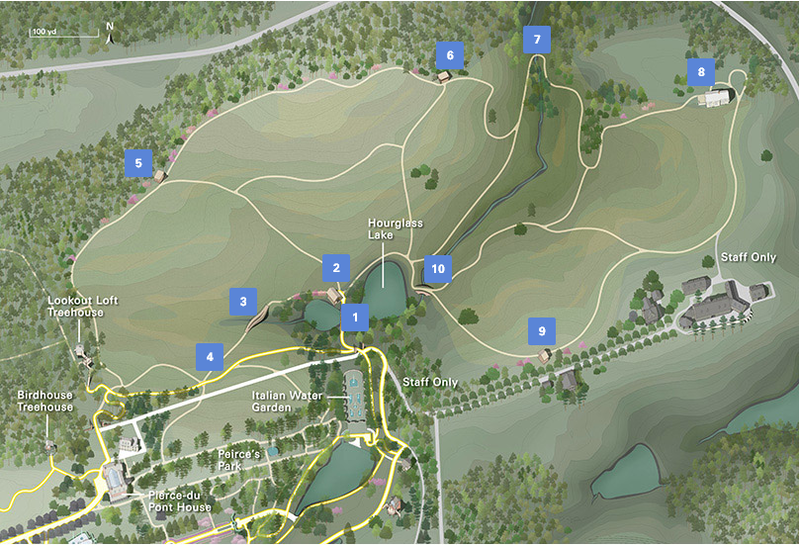 The Meadow Garden can be explored via three miles of walking and hiking trails. These vary from the short ADA-accessible boardwalk, which gives an overview of the meadow and its insect life, to the longer (1.7-mile) outer meadow hike, which includes stops at multiple educational features. The longer route follows mown grass trails over varied terrain with some bridge crossings. A tram is available for transportation to and from the Webb Farmhouse located at the far end of the meadow. The first of three learning pavilions along the perimeter trail, the Forest Edge Pavilion, describes interactions between flora and fauna and the ecological role they play in the succession from meadow to forest. Here, small trees such as Cercis canadensis (eastern redbud), Cornus florida (flowering dogwood), and Chionanthus virginicus (fringe tree), serve as a transition between the meadow and the bordering 150-year-old forest. An established schedule of mowing and burning helps to maintain the meadow landscape. The shelter at Pollinator Overlook has charming mixed-media artwork that explains the vital importance of pollination and illustrates various insects and animals and the plants they pollinate. Outside, a group of bee houses shows how visitors can support these insects in their own gardens. The trail continues across a creek at Beech Forest Boardwalk before heading to the historic Webb Farmhouse. This restored structure, dating from the mid-1700s, has two interpretive galleries. 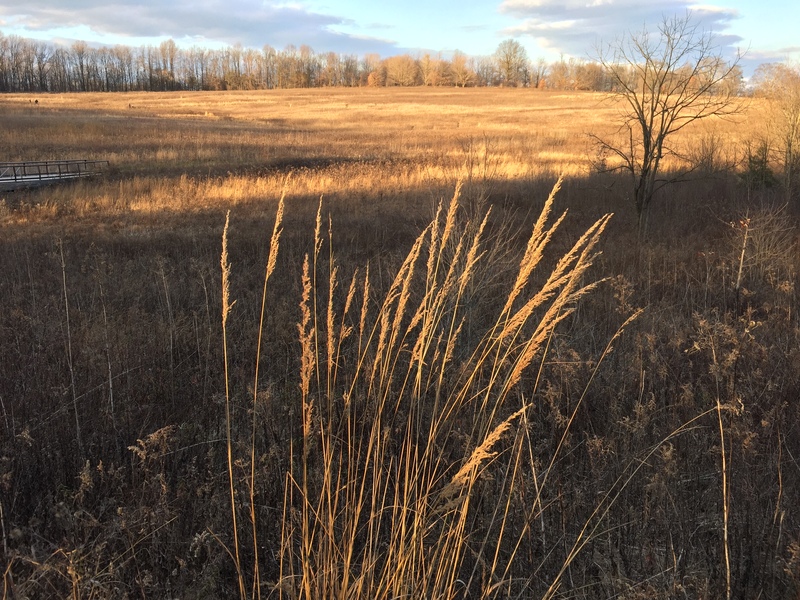 One has pressed plant specimens and photographs depicting the meadow through the changing seasons, and the second demonstrates how land use has evolved from the occupation of the Lenni Lenape Indians through colonial times to the present day. Hawk Point, located at a high point of the perimeter trail, provides a perfect place for viewing birds. This pavilion has information on the variety of birds supported by the Meadow and features clever suspended silhouettes to help visitors identify larger species. A final attractive feature of the meadow is the signage located along the various paths. Interpretive signs explain important principles such as plant succession in easy-to-understand language. Other signs spotlight quotes on nature from prominent naturalists and environmental philosophers. Additional educational opportunities include periodic “Meadow Days.” A recent event in June 2018 focused on pollinators and involved various games and activities for children and lectures and nature walks for adults. Hours vary by season and day of the week. See Web site for details. The Longwood Gardens Web site, has a variety of helpful information for planning trips, such as plant location maps, weekly updates on flower blooming, and a gallery of photos. Periodic blog posts from “Meadow Gardener” Colin McCallum-Cook provide more details on the denizens of the meadow and sustainable gardening principles. Check out a two-minute video about the meadow under the Plant Explorer section of the web site. *For more information on the native plants mentioned in this article, check out our Tried and True Native Plant Selections for the Mid-Atlantic factsheets. For another article in this series, check out Christmas at Longwood. This entry was posted in Regional Gardens and tagged Longwood Gardens, Meadow Garden at Longwood Gardens, Meadows, Regional Gardens. Bookmark the permalink.